My migration from iPhoto to Photos continues, and today’s snafu was my discovery that I couldn’t rename files in Photos. This is something I’ve long done in iPhoto—not for every file, but for ones I’d like to group together using something other than Keywords. The inability to rename files isn’t critical, in particular because the Title field can be used for the same functionality. But I had a problem: When I migrated, Photos created Titles for some, but not all, of my custom-named images. In particular, it missed all of the iOS wallpapers. I’m not sure if this is because these aren’t photos in the traditional sense—they’re edited photos I export as PNGs. But whatever the reason, I had hundreds of images that needed a Title that was equal to their Filename. AppleScript to the rescue…this simple bit of code acts on the selection in Photos, and sets the Title equal to each image’s filename. error "Select photos before using script." To use this bit of code, just select the photos you’d like to modify in Photos, then run the script. You can make it a bit easier by saving the script into your user’s Library > Scripts > Applications > Photos folder (create as many of those as don’t exist). It will then be available in the AppleScript menu in the menu bar, assuming you’ve enabled that in the AppleScript Editor’s preferences. How would you compare scriptability in Photos compared to Aperture? The extensive scriptable hooks in Aperture were one of the things that made it so awesome. I’m still on Mavericks so haven’t had a chance to check out the Applescript Dictionary for Photos.app to see how deeply they’ve embedded the scripting interface. I’m far from a scripting expert, but I’d describe Photos AppleScript support as relatively basic, especially when compared to Aperture. 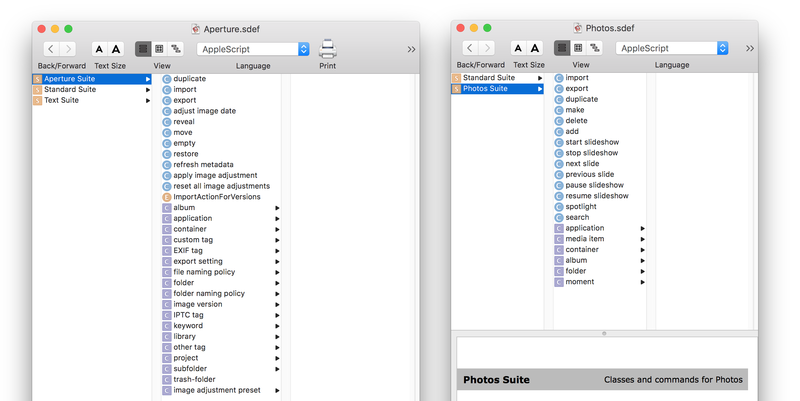 Here’s a huge screenshot showing the dictionaries for each; Aperture’s is clearly much deeper. I’ve just used this script to fix the problem in High Sierra that prevented me from searching titles at all. I had 55,000 pics to index and I was damned if I was going to do that all over again. Thanks hugely!